Properties in Limavady average 4.8 out of 5 stars. Ocean view apartment with terrace, parking and golf nearby. Property 1: Ocean view apartment with terrace, parking and golf nearby. The Snug @ Clarence perfect hideaway in the walled city. Spacious, homely stay at very central apartment. David's attention to detail is the cherry on top. From the moment we first interacted with David during the booking stage he made us feel very welcome. Being met by him personally when we arrived at the apartment (stocked with the basics such as m8lk, bread and butter) reinforced this experience. Staying over Christmas, another special touch was the Christmas tree, lights and treats. We prepared Christmas dinner in the well equipped kitchen after stocking up on the required groceries at a local spar suggested by David. 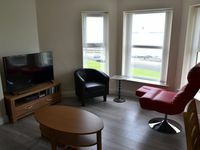 The apartment is located perfectly to explore Portrush on foot and all the local sights along the Causeway scenic route. We had a truly memorable time in this apartment. Thanks again, David! Can&rsquo;t say enough good things about our visit. Check in was easy, ample parking even in high season, clean modern place with privacy and good sound proofing. Modern appliances. Host provided linens and all the conveniences and even a basket with coffee / treats.